2012 is on the way out and 2013 is on the way in. I always enjoy seeing the fireworks that welcome in the New Year around the world and I made this card to show a celebration of the New Year arriving. I created the fireworks on the night sky by hand drawing with Glitter pen and stickles. Stamps: MFP's Big City, Flourishes Sentiment. Wishing everyone a Happy New Year! We are spending a quiet night at home. It has snowed all day and streets are covered again so will be safe and cozy at home. Have a safe New Year's Eve! Second post today.....trying to catch up with some challenges. 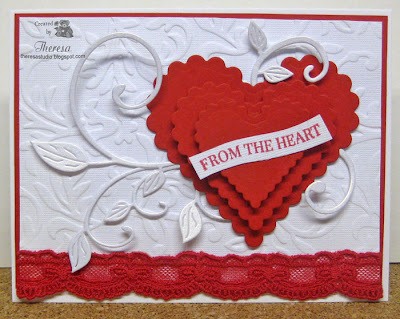 The challenge at Cheery Lynn- to use lace- inspired me to create a Valentine's Card. 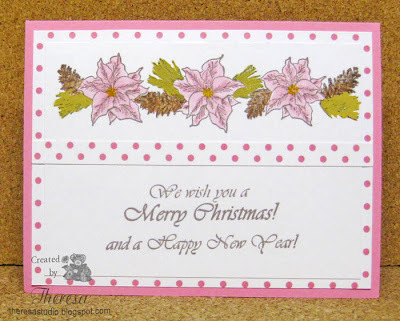 I knew I wanted to use Cheery Lynn Fanciful Flourish Die...one of my most favorite dies. I cut the die twice from some white iridescent card stock. I found some red lace in my lace box that I have had forever from a challenge prize. Trying to use up some of my stash. I cut 3 scalloped hearts using Nesties and GKD red card stock and layered with pop up dots. I used a white card base , then a layer of the red card stock, topped with an embossed textured white card stock using Cuttlebug EF Victoria...gives a romantic feel. I edged this layer with the lovely red lace and arranged the flourishes and the stack of hearts. I finished with a banner stamped with Flourishes " From the Heart" that I free cut. I may add some pearls to the heart but leaving card as is for this post. Tuesday Morning Sketches: Anything goes. No sketch this week which is unusual for this blog. I used more layers than I usually do, and liked stacking the hearts and letting the flourish float on the card rather than gluing it down. It is always fun to find forgotten items in your stash which are the perfect item for a card. 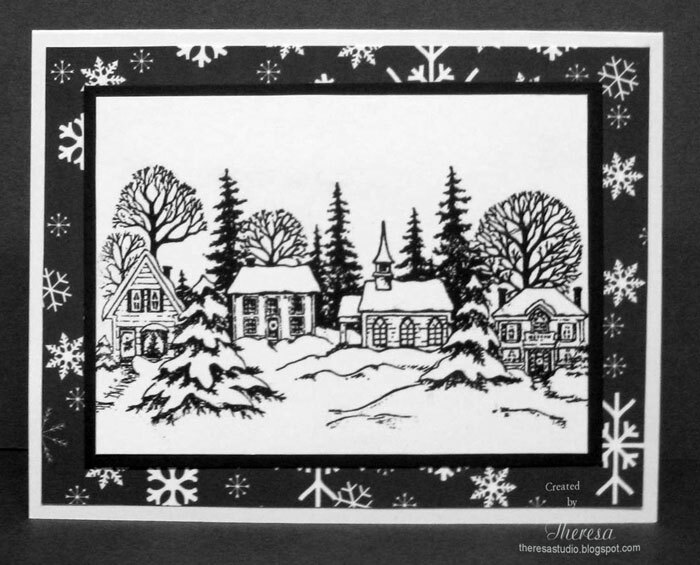 One of my favorite winter stamps is this "Christmas Village" by PSX which I have used for many cards. 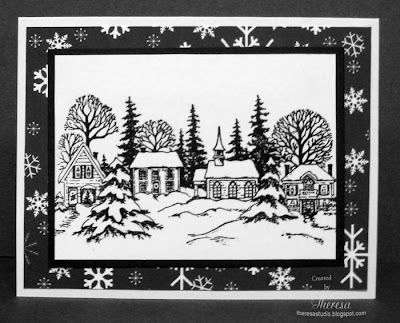 This time I am using it as a simple black and white card using Versamark and Ranger black embossing powder on GKD white card stock with no coloring or embellishing. 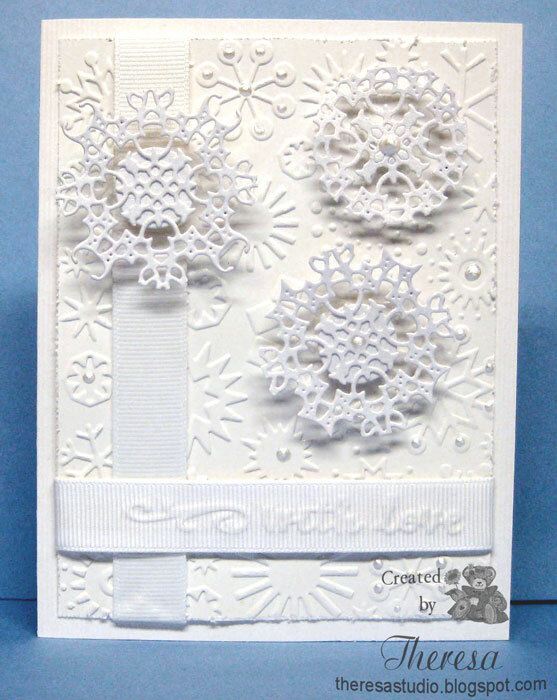 I used a GKD white card base, a mat of digital Snowflake Pattern Paper from Dreamees, and a solid black mat directly under the image. Looks like we are having more snow today. Allsorts Challenge: It's as plain as black and white. We have had more snow here in Ohio but my thoughts have shifted to the beach and warmer temps in this card. 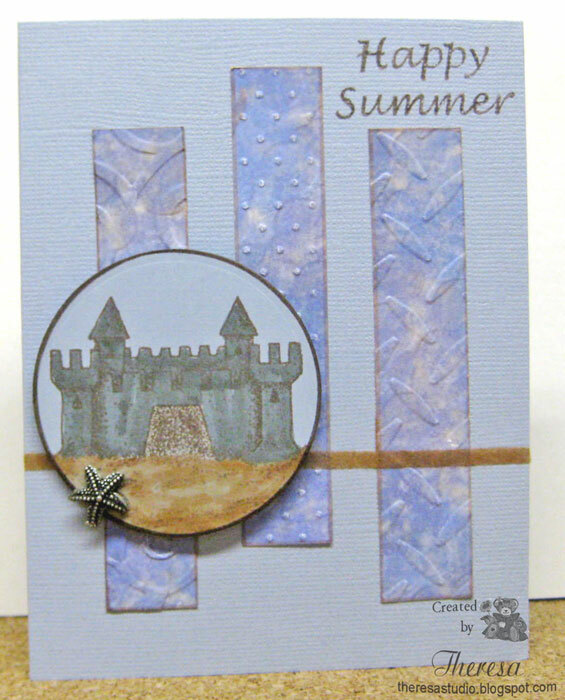 I am trying to use some unused stamps and decided to use this sandcastle stamp which inspired me to create a summer card. I used the Sketch Challenge from What If? Wednesday. 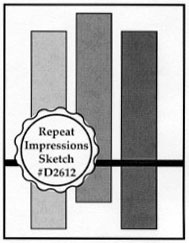 To add interest to the strips on the design, I used 3 different EF's instead of 3 colors or DP's. I also added a strip of flock to represent sand and a starfish charm. Stamps: Repeat Impressions Sand Castle and Sentiment. Papers: Bazzill Textured Blue CS, GKD PP from Pool Side Pack. Maybe this will warm me up. Snow is on my mind since that is what I see when looking out the window. 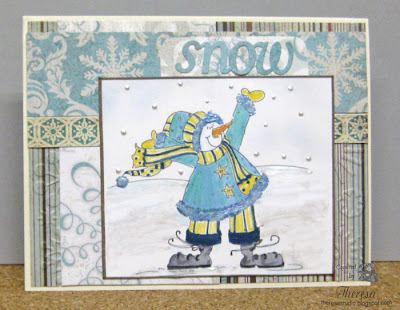 There are so many cute snowmen stamps and some of my fave ones are from Sassy Cheryl. 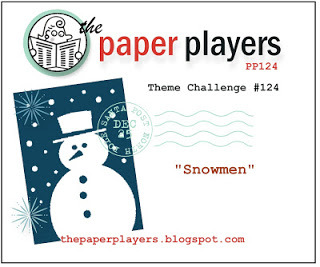 I just knew I had to play in her latest challenge to use a snowman and I used a great sketch from Sweet Sunday. I did not know how hard it would be to photograph an all white card and using a blue background probably was not a good thing as it made the white look blue. This is not the best photo but it will have to do. 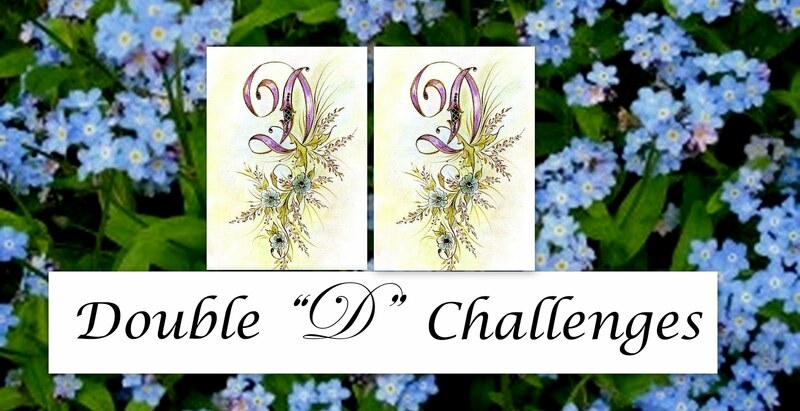 I made this card to enter in a few challenges. Used 3 types of white cs...glossy, iridescent, and a textured one for the base card but none of that shows. 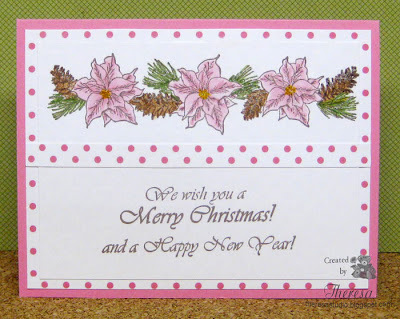 I embossed glossy CS with Cuttlebug EF Snowflakes. 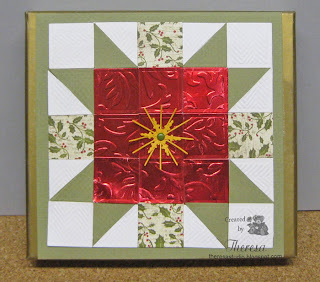 Cut 3 snowflakes with Cheery Lynn #3 snowflake die but trimmed edges to appear as different shapes. Popped these up with foam dots. 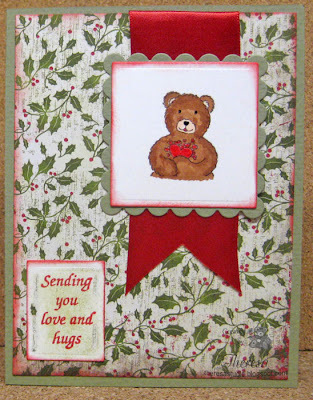 Added white grosgrain ribbons strips for additional texture. 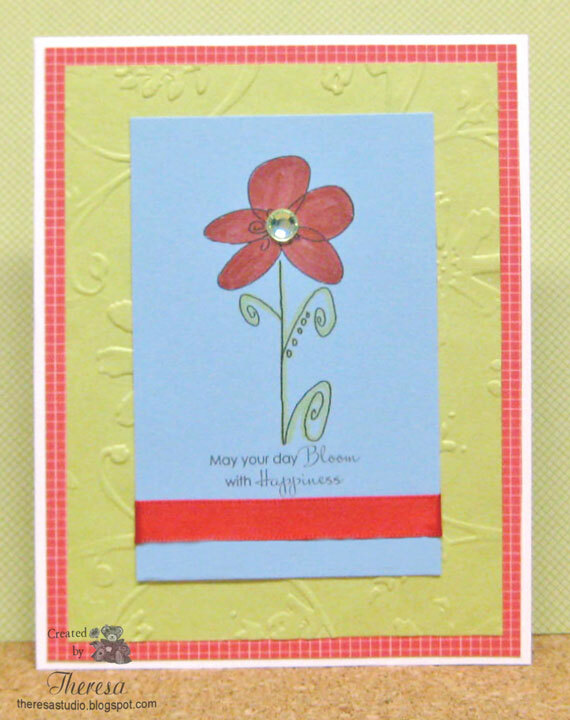 I embossed one with Cuttlebug EF Border "With Love". Added liquid pearls to embossed design for sparkle and texture. 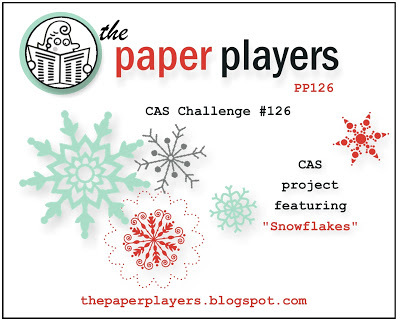 Paper Players: CAS- Feature snowflakes. See graphic. 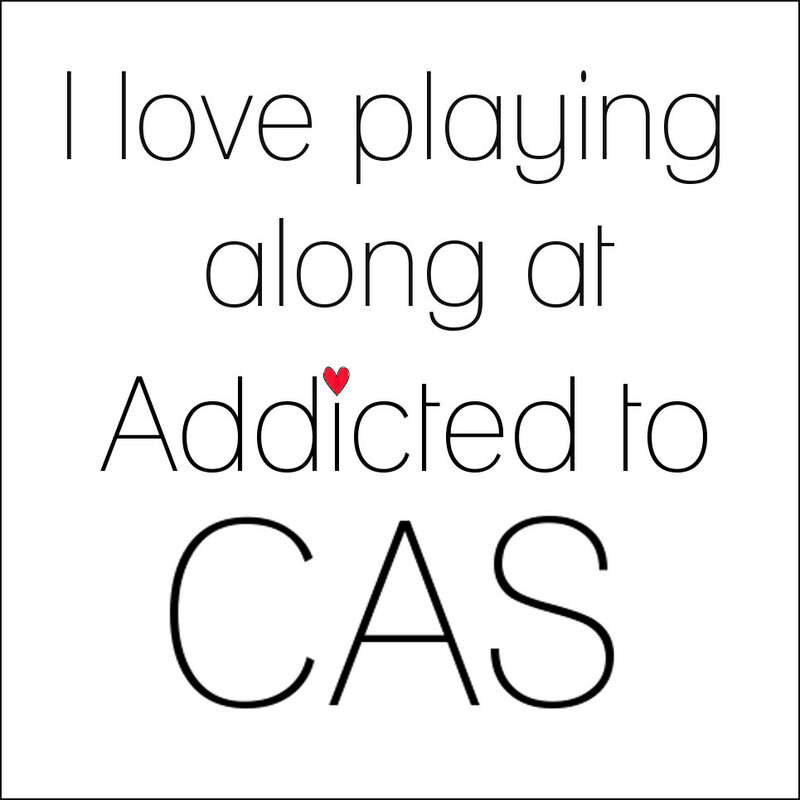 No coloring or stamping made this a CAS card for me. Alphabet Challenge: W is for Winter White. Do not use any color. 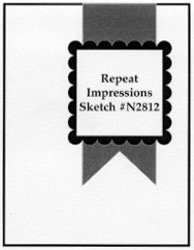 Fab 'n' Funky Challenges: Add ribbon and/or lace. Hello all! I hope you had a great holiday with family and friends. Things are getting back to a normal pace and I am trying to get back into a routine of making cards and blogging. 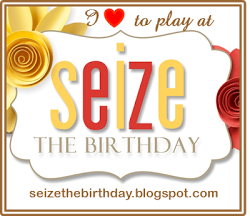 I have missed these activities for the last few weeks and mostly have missed visiting with my friends in blogland. 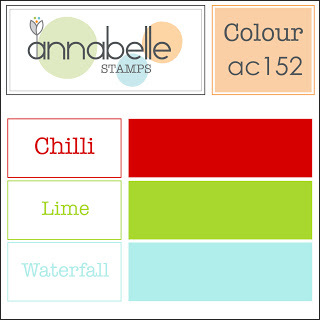 To get back into the swing I have made a card to enter into Annabelle Stamps Challenge- to use colours of Chili, Lime, and Waterfall. 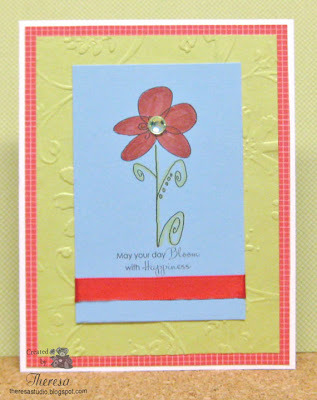 I think I matched up the colors well enough and used 2 free digis from Annabelle- the flower image and the sentiment. 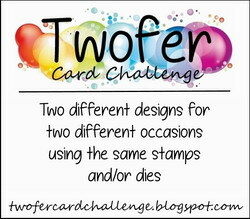 I printed both on the Blue CS from stash and colored with Copics R24 and YG03. I added a red ribbon to this layer. 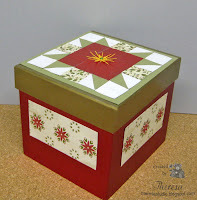 I used a mat of Lime CS from stash that I embossed with Cuttlebug EF Stylized Flowers under the image. Attached this to a layer of Annabelle Digi Paper Chili Check and then to a White CS Base. Finished with a green rhinestone. I never printed a digi directly on colored cs and then colored directly on the color cs but I like the result of how the colors on the blue cs stayed a true color. 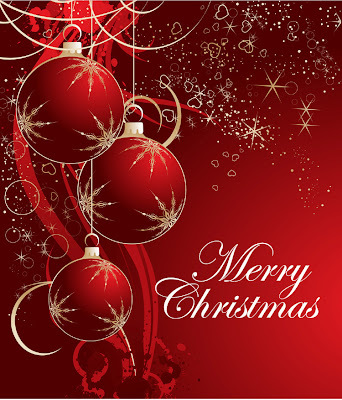 It was fun to make a card other than a Christmas theme. With the snow we have had, I am inspired to take on some winter and snow card challenges. I hope to be back soon with some more posts. Enjoy the after holiday time after all the hurry and scurry. I enjoy all your comments. See you in blogland. much love, hope, and peace. 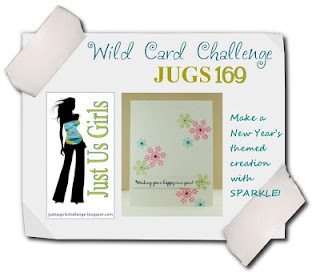 I have been trying to use some of the items I had leftover when making cards and did not use. 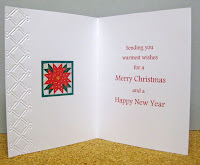 Here I used a piece of red cardstock that I had trimmed and embossed with Snowflakes and sponged with green ink. I pulled this out, added a green ribbon amd green base card. 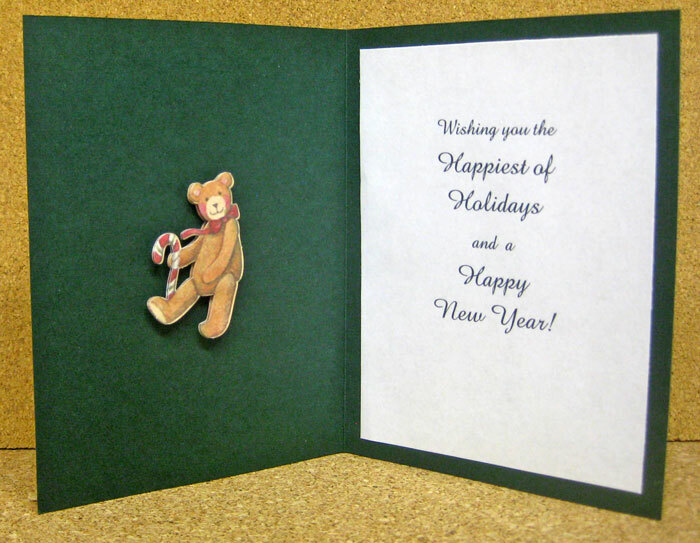 Attached a Die Cut from Susan Winget and have a finished card. 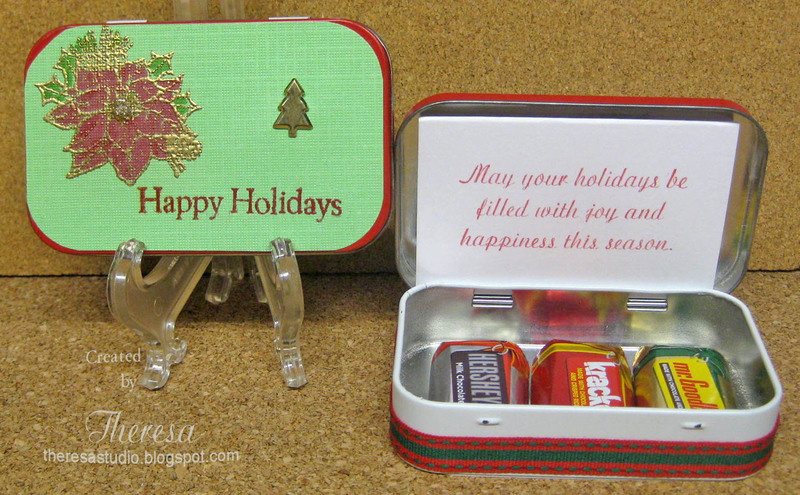 I finished the inside with another Susan Winget die cut and printed message. 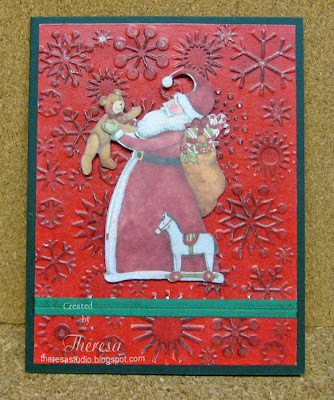 Christmas Cards All Year 'Round: Use Santa on cards. This was a quick card that I made using some of the items that I had in my stash. 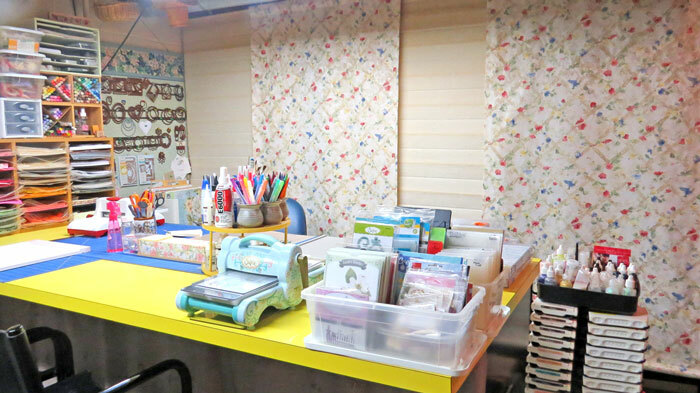 The background is a digi paper from GKD that I had printed, trimmed, edged with gold and embossed, but never used. 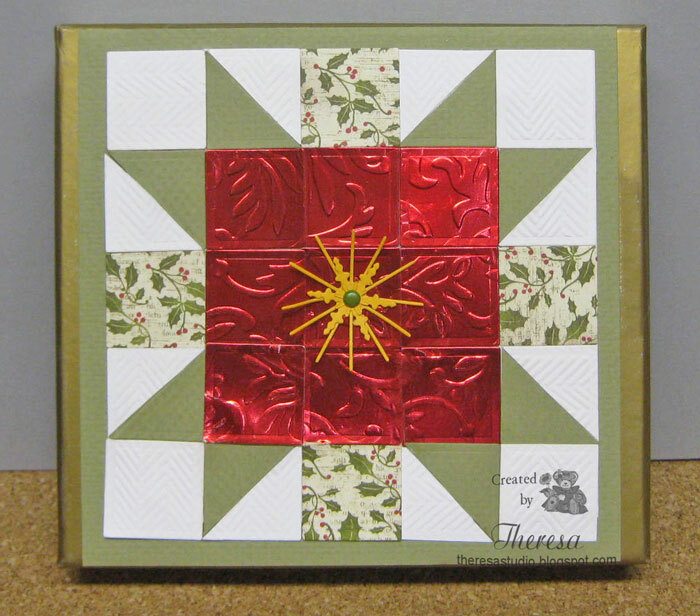 I attached to a base of White CS and then attached the Reindeer cutout with pop ups. 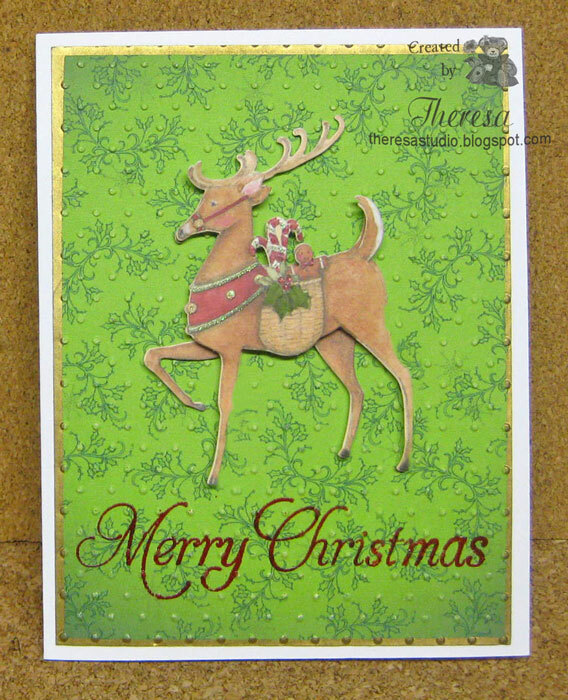 The deer was from a pack of Susan Winget Christmas Die cuts that I had forgot about. 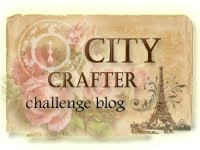 Craftyhazelnut's Christmas Challenge: Use a reindeer. 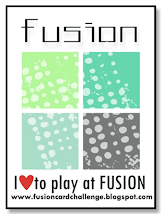 Color Throwdown: See graphic below. There is some black on the deer. Note: I redid photo since it showed 6 legs. The cutout is a 3D and 2 of the legs were not lined up in first photo so it looked like a 6 legged deer. I made sure the legs were attached in the redo. 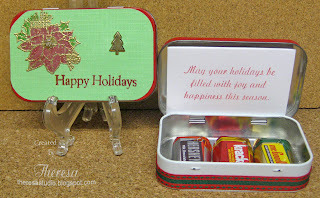 I have some Christmas ideas to make with Altoid tins. I have saved several of these tins over the year. I decorated the top and covered the bottom of the tins and attached ribbons around tin with scor-tape. 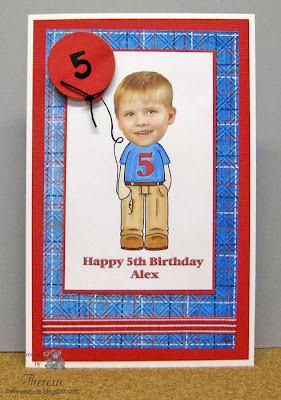 Th trick to making these quickly is to use adhesive card stock for the top and bottom. 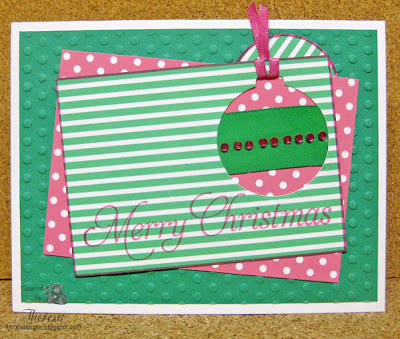 I used a textured adhesive CS from DCWV which has an assortment of colors. 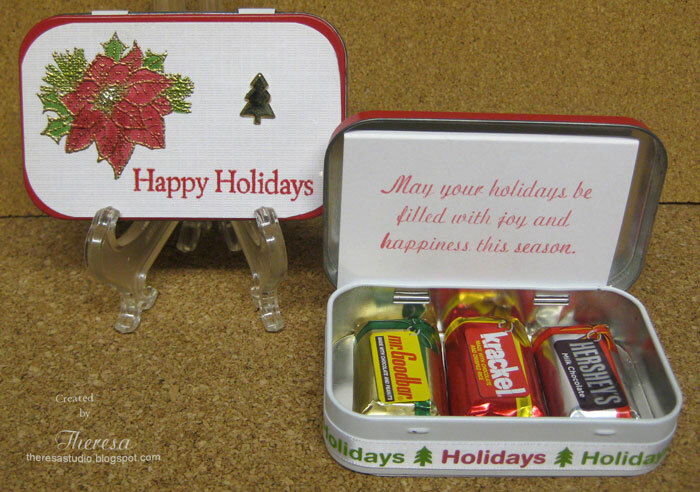 I will use the tins as gifts with candy, money and/or gift cards enclosed inside with a note. Flourishes Timeless Tuesday: Altered Christmas-All you need to do is create anything that isn’t a card for Christmas. 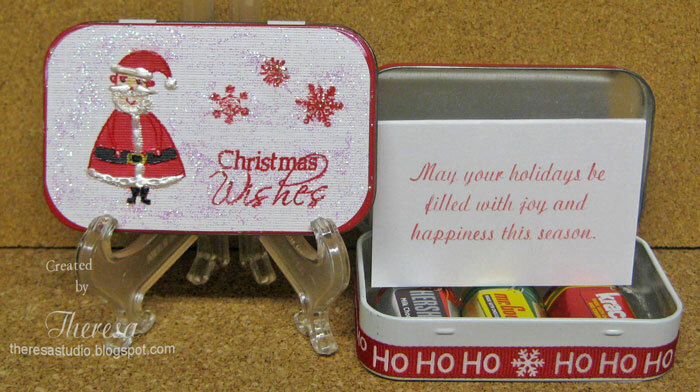 The Ribbon Girl: Ho Ho Ho-Show your Christmas Projects.Used ribbon on tins. Whoopsi Daisy: Use Up your Stash.I used items from my stash of tins, brads, ribbons, and more. Today, I am showing a Christmas project that I made as a gift for my Mother... a box of Christmas cards using a box that I recycled that contained a gift of nuts. 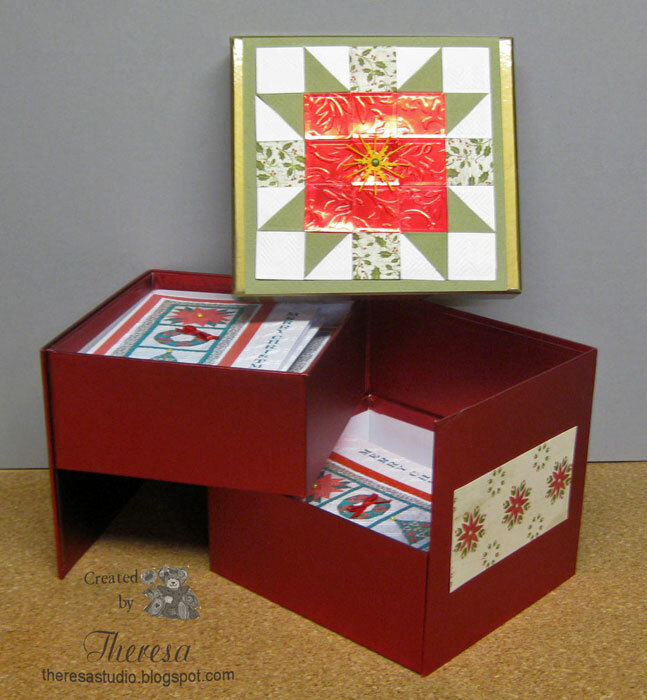 The inside of the box folds out revealing the space I used for the cards, stamps, and address labels. Since my Mother is a quilter, I designed the top like a quilt square piecing squares of paper that were embossed for texture. 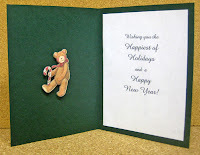 Used die cuts and brad in center. Added DP to sides. PaperPlay Challenges: Christmas is Coming. 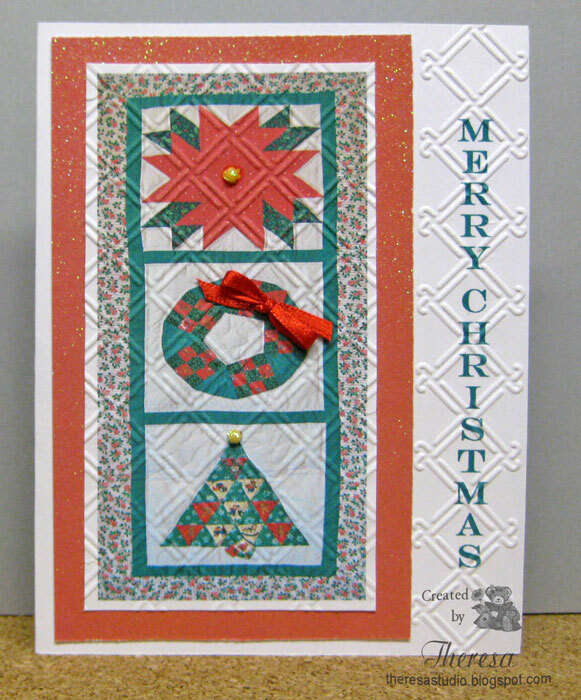 Flourishes Timeless Tuesday: Create An Altered Christmas- All you need to do is create anything that isn’t a card for Christmas. Did a box of Cards. Second post today. This card is for Meljen's Sketch challenge shown on the left. 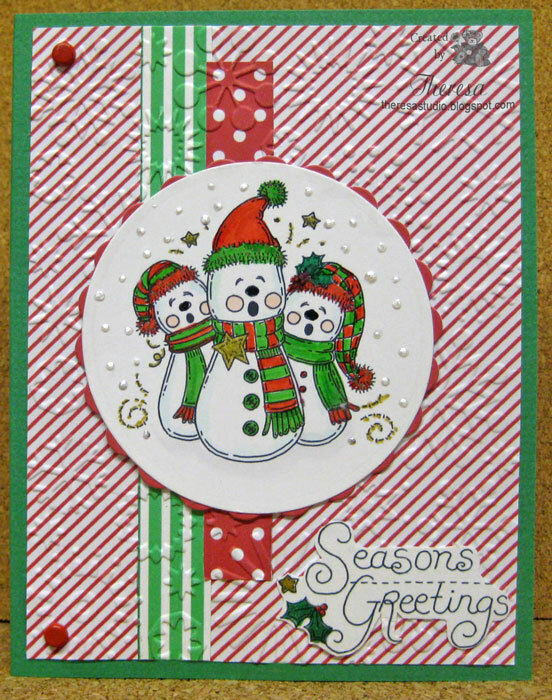 I love this group of Caroling Snowmen and it is so fun to color...this time I did it in red and green to go with the papers I had laying on my work table. 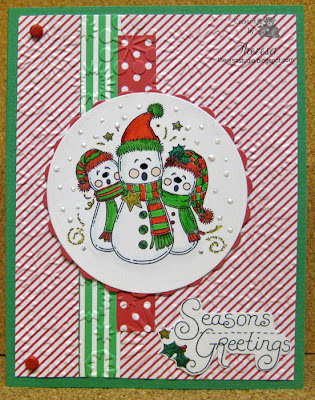 Added some snowflakes with embossing and liquid pearls. Cut out the Meljen's sentiment to finish. Cute Card Thursday: Theme is snowflakes-used embossed snowflakes and added liquid pearl snowflakes. Welcome. 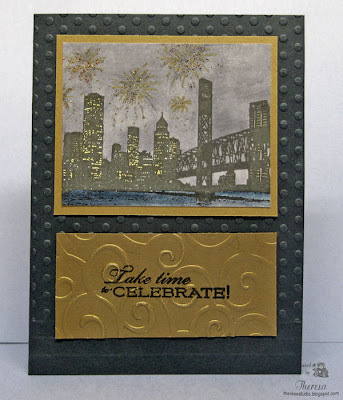 Today I am posting a card made for a sketch challenge at The House That Stamps Built. 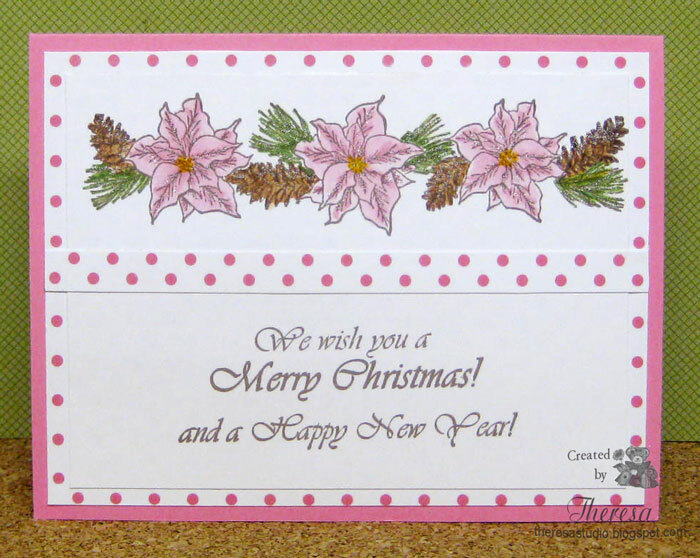 This is a simple card using holly pattern paper to give a holiday look. Crafty Catz Challenge: Recycle/Upcycle- Wide satin ribbon was saved last Christmas from a gift of Holiday Bread. One Stop Craft Challenge: Create something for Christmas for the Men/Boys. What guy does not like some love and hugs? Welcome! 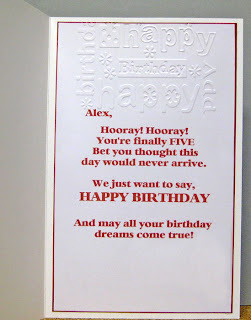 I forgot to share this card that I made for my great-nephew's 5th birthday last week. 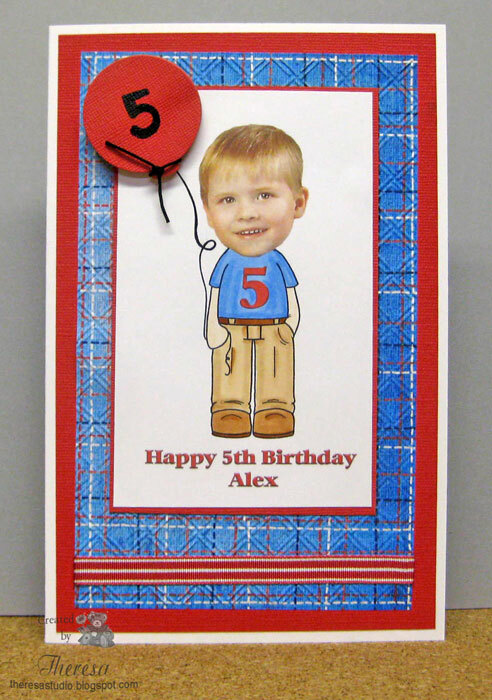 I always try to personalize childrens' cards and I thought using a picture of Alex would surprise him. I simply scanned a picture of him and placed his head on a digi image "Balloon Trevor" from C.C. Designs. I colored with Copics.I used a card base of white, red layers, and a layer of a digi plaid paper from Summer Driggs. Added some stripe ribbon and a 3D cut out balloon with string attached with pop up dots. The plaid layer was embossed with Cuttlebug Wicker Weave for texture. Love how cute his image turned out. 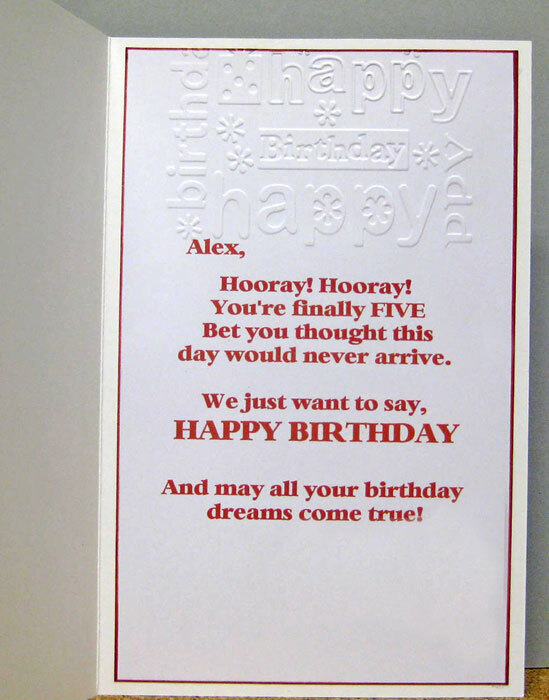 I used Photoshop for editing the photo and combining the photo and image and also for the sentiment and printing the inside of his card. 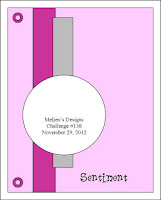 Sweet 'n' Sassy: Interior Decorating Challenge-do inside of card. Used digi image and digi paper. 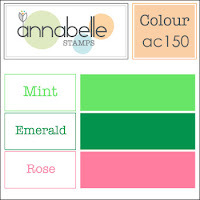 This week, the challenge at Annabelle Stamps is to use colors of mint, emerald, and rose. I just purchased digi papers from there that are perfect to use. 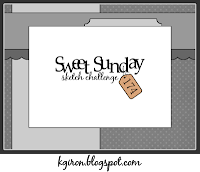 I used a sketch from The Sweet Shop to create my card. I cut the ornament from the top layer so the polka dot layer shows. I trimmed the "Ornament"with gems and ribbons. The ABC Challenge: C is for Clear it out. Using some rhinestones and ribbons that I have had for years in my stash. 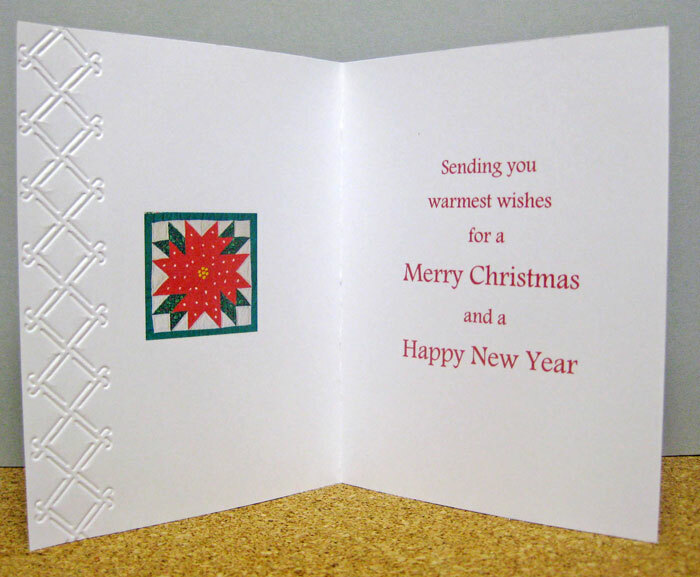 How many holiday cards do you mail? Are they ready to send? 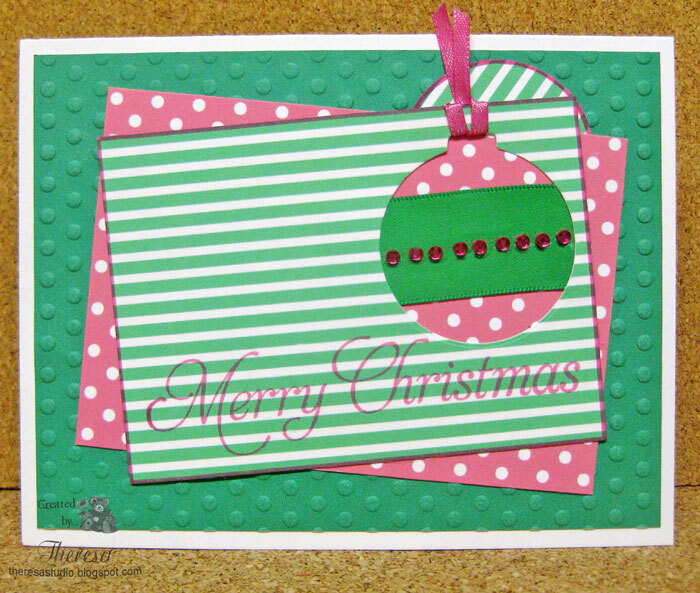 My friend Linda is hosting the Friday Free All Challenge at Stamp TV this week and I made this card for her challenge to create a Christmas project with no Reds or Greens using non-traditional holiday colors. I guess I broke the rules because I do have a tiny bit of green. 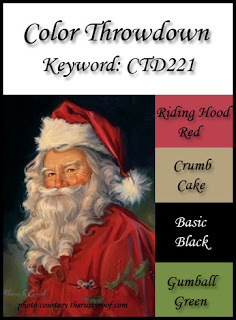 I was just thinking that Pink and Browns were not traditional Christmas colors and lost sight of no greens. OOPS! 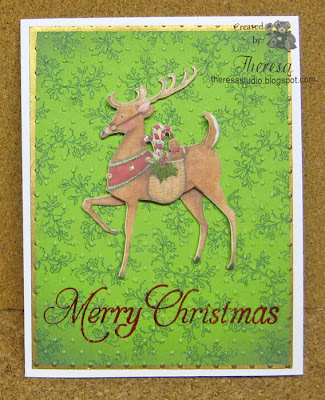 I did a redo using gold Spica pen to color the pine so would not have green on card for STV Challenge.